After a rather busy [What an understatement, at that..!] three weeks working at Digital Manga on Tenshi ni Narumon!, I contemplated that the trip out to Canada would be quite rewarding. With school also peeping it’s way into the whole ordeal, Canada sure looked like it would be a delight in itself… as well as a long weekend consisting of practically no rest! With a late Friday-afternoon flight, I arrived at the Marriot Hotel - - literally minutes before the Opening Ceremonies, as well as the “Red & White Show”, I made a swift dash to my hotel room aided by Lionel Lum, humble creator of usagichan.com. Within mere minutes, I was already in my Seiya costume and ready to roll. The Senshi-tachi of Sailor JAM-boree were ready and waiting for me at the event, as it commenced nearly fifteen minutes after I had arrived. Talk about timing! Guests were of a colorful variety, as both American and Japanese personas graced Anime North’s halls. A few of the JAM-gals and myself had met with a few of the prestiged guests, as well as the comedic character himself, Van Partible, creator of Johnny Bravo. Saturday morning. Dressed in another attire, also of Seiya’s nature, the Senshi-tachi and I attended the Guest’s Brunch Gathering. Again, we had the honor of meeting the guests of the convention, as Mr. Fred Ladd gave us all a rousing speech. After consumption of the great food ended, guests made their ways about the con. SJ had broke into various groups, as we all went to enjoy various parts of the convention, till more practice for our show would take place later that night. I know for sure that Miss Tristen Citrine [SailorGalaxia/SailorVenus of Sailor JAM-boree] was busy to no end, as she was Anime North’s living mascot this year. Kakkoi! Venturing to the dealer’s room and the forever crowded halls of the convention, I found that most attendees were greatly kind. Being from California, I know that some people can be sour [attendees, as well as workers and whatnot] but Canada seems to be a really nice place, in general. I’d like to come back again soon, or even for the next Anime North. Saturday wasn’t a terribly busy day for our group, as we co-hosted a panel on Cosplay Groups. It was a good chance to meet and see other fellow cosplayers, and I think we all learned something from the experience. 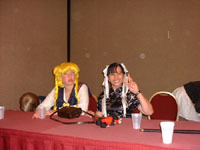 Later that night, we attended the Masquerade - - a tradition in nearly all Anime conventions and those alike. Let me tell ya, folks. I can honestly say that this Masquerade was unlike any other. Filled with truly unique skits of all anime, this Masquerade was an enjoyable one. I believe an assumed 78 acts had strut across the stage, however, many of which also did not show up. Ah well, perhaps next year, neh? 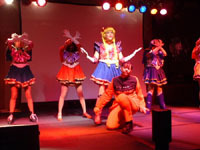 After the nearly two hour Masquerade, the J-Pop dance was mere moments away. Also attending that as well, I found it to be a great gathering; Music wasn’t drab at all, and there was a mambo-line marching nearly every other song! Talk about party animals! Finally, Sunday. It was hard to believe that the convention had passed in such short time, yet it gave the feeling of much still to come. Bizzare. Awaking with at the wee hour of seven [that’s four o’clock to you non-Westcoasters…] the Senshi-tachi and I drug ourselves out of bed to have a three hour practice for our stage show at noon. 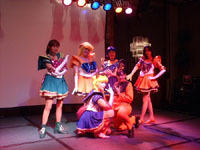 We were to have a SeraMyu panel as well, however, with a timely schedule, it had to be canceled. Nevertheless, we prepared for our first real “show” ever - - hosted by yours truly. With much thanks to our Stage-Maus, as well as Joshua and Lionel, the show was a great hit, and I think you can blame me for some Canadians disliking Mamoru and swaying to the Seiya-crowd now.. ^.^() During one of the last numbers in the program, we had the opportunity to give out the new series of Sailor Moon dolls by Irwin. The crowd was ecstatic, as we ended the fifteen-number show with a smash. Finally, Dai can rest, right?…. Not! After the concert show, SJ was asked to participate in the Charity Auction. We did it, and it was quite a treat to watch. Even the head of ChibiUsa was up for auction, believe it or not. - - Don’t ask. Just think “pinata.” I’ll never forget what the host said, however; “And indeed, ChibiUsa’s head was filled with exactly what we all thought it would be - - Pink Sugar Candy.” All proceeds from these auctions went to the needy children within Toronto / Canada - - more power to AN! Later that day, I had come in contact with my relatives whom lived in Toronto themselves. Although they were unable to attend the concert show, they took myself and three friends out for a sight-seeing trip around downtown Toronto. This was definitely a treat for us all, as three of us hadn’t seen anything besides the airport and vicinities of the hotel. All in all, the trip was a more than wonderful one. Truly something that can’t be expressed in words. As Sunday night rolled over, Monday morning ascended. Having an early flight, I got to bid farewell to a selected few of my roomies as I made way for the airport with Gina and Annie [two members of JAM- boree as well] at the wee hour of five in the morning, and off I went back to the US. It was a great experience, Canada, and I’d love to return again. Thanks goes out to the staff of Anime North, as well as it’s attendees and all. See you again soon!